Readers can plunge into the perplexing and seemingly unanswerable questions of life found in the Gospel of Matthew and learn to trust the One who described Himself as the way, the truth, and the life. Do you think of Jesus as the One with all the answers - a kind of divine answer-man sent down to earth to tell us everything we need to know? And if so, do you find yourself a little perplexed by the nagging questions in life you never seem to find answers for? A careful reading of the gospel of Matthew shows that Jesus asked questions just as often as He gave outright answers. Life is full of questions, and an honest believer learns how to embrace those questions and build a stronger faith in the process. This fresh new Bible study, filled with provocative anecdotes and excerpts from literature and current events, will help you do just that. 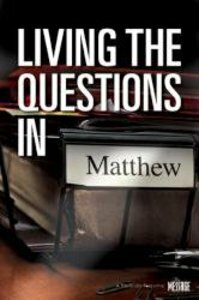 About "Living the Questions in Matthew"
This revealing study of the Gospel of Matthew, based on "The Message," will help readers embrace life's questions and build a stronger faith in the process.